Aortic bifemoral (aortobifemoral) bypass is a surgical procedure that is performed in patients with atherosclerotic disease of the infrarenal aorta and iliac vessels (see the images below). Most patients who undergo this procedure have symptoms of claudication, impotence, and poorly healing ulcers. Examination usually reveals absent or very weak femoral pulses. Type I atherosclerosis with occlusive disease limited to infrarenal aorta and common iliac arteries. 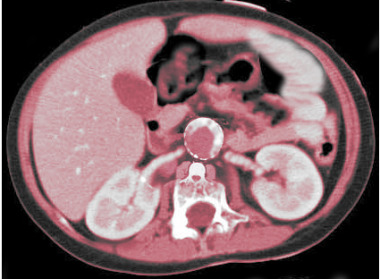 CT scan of abdomen showing calcified abdominal aorta. 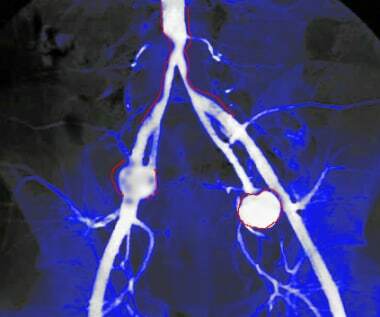 Image shows significant disease at aortic bifurcation and iliac artery aneurysm. Because aortic bifemoral bypass requires general anesthesia and is an extensive procedure, it is contraindicated in patients who are very old, frail, and unfit for surgery. Moreover, patients with symptomatic heart disease, recent stroke, or myocardial infarction (MI) need an extensive preoperative workup. Accurate assessment of the aorta and the iliac vessels is critical. Other options for treating aortoiliac disease may be considered. Appropriate patient preparation will minimize complications. Today, there are a number of radiologic tests that can help assess the aorta and iliac vessels. 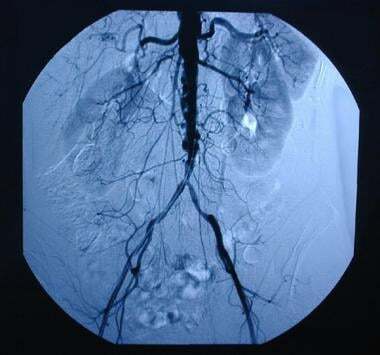 Conventional angiography, the previous standard, is fast being replaced by computed tomography (CT) angiography (CTA) and magnetic resonance angiography (MRA). Angiogram showing fusiform aortic aneurysm. In aortic surgery, as in most branches of surgery, minimally invasive  and laparoscopic techniques have been introduced with the aims of improving outcome, decreasing postoperative pain, and shortening the hospital stay. In the past two decades, many experimental and clinical studies have attempted laparoscopic aortic bifemoral bypass. However, this technique is still challenging, and there is a need for better instruments. Current instruments do not allow very fine anastomoses to be made in difficult areas of the body (eg, the groin and pelvis). Despite the plethora of reports on laparoscopic vascular procedures, the results are not yet considered to have matched those obtained with open techniques. Moreover, complications of laparoscopic procedures continue to occur, and there is still a need for long-term data. [10, 11, 12] To make matters worse, the reporting of complications during laparoscopic procedures is not mandatory, and most complications are underreported. At present, laparoscopic aortic bifemoral bypass is performed only by a handful of surgeons from a few centers. [13, 14, 15, 16, 17] It is not the criterion standard. Future improvements in instrumentation and ongoing development of surgeons' skills may someday make this procedure more routine. The open aortobifemoral approach has withstood the test of time, and until long-term data are available, the laparoscopic approach should still be considered experimental. The chief advantage of angioplasty is that it eliminates the morbidity associated with aortic bifemoral bypass. Except for bleeding at the groin site and pseudoaneurysm, complications are much less common with angioplasty. Recurrence of stenosis is a problem and may present as recurrence of symptoms. Studies by Maldonado et al  and Van Haren et al  have reported good midterm results with the use of a unibody bifurcated endograft (Endologix; Irvine, CA) to treat complex aortoiliac occlusive disease. In some cases, a patient may have significant aortoiliac disease but may not be a candidate for general anesthesia. For these patients, options such as extra-anatomic bypass grafts are available. Femorofemoral bypass and axillofemoral bypass are decent alternatives to aortic revascularization. Femorofemoral bypass is an excellent procedure if one iliac artery is normal. Axillofemoral bypass is suitable for high-risk patients in whom a transabdominal procedure cannot be performed. To prevent complications, a careful workup is essential. In all patients, cardiac and respiratory status must be assessed before the aortic procedure; at least 10-20% of patients have significant coronary artery disease (CAD) that may have be addressed preoperatively. In particular, all high-risk patients must be cleared by the cardiologist before the procedure because most of these patients have CAD. Even though there are reports of combined coronary artery bypass and aortofemoral bypass procedures being performed in the same setting, these are isolated reports and do not represent the standard of care. Complications with combined procedures are significant. Zelenock GB, Huber TS, Messina LM, et al. Mastery of Vascular and Endovascular Surgery. Philadelphia: Lippincott Williams & Wilkins; 2006. Ascher E, Ed. Haimovici's Vascular Surgery. 6th ed. Chichester, United Kingdom: Wiley-Blackwell; 2012. Cronenwett JL, Johnston KW, Eds. Rutherford's Vascular Surgery. 8th ed. Philadelphia: Saunders; 2014. West CA Jr, Johnson LW, Doucet L, et al. A contemporary experience of open aortic reconstruction in patients with chronic atherosclerotic occlusion of the abdominal aorta. J Vasc Surg. 2010 Nov. 52(5):1164-72. [Medline]. Rao A, Baldwin M, Cornwall J, Marin M, Faries P, Vouyouka A. Contemporary outcomes of surgical revascularization of the lower extremity in patients on dialysis. J Vasc Surg. 2017 Jul. 66 (1):167-177. [Medline]. Andrási TB, Humbert T, Dorner E, Vahl CF. A minimally invasive approach for aortobifemoral bypass procedure. J Vasc Surg. 2011 Mar. 53(3):870-5. [Medline]. Tiek J, Remy P, Sabbe T, D'hont C, Houthoofd S, Daenens K, et al. Laparoscopic versus open approach for aortobifemoral bypass for severe aorto-iliac occlusive disease--a multicentre randomised controlled trial. Eur J Vasc Endovasc Surg. 2012 Jun. 43(6):711-5. [Medline]. Segers B, Horn D, Lemaitre J, Roman A, Stevens E, Van Den Broeck V, et al. Preliminary results from a prospective study of laparoscopic aortobifemoral bypass using a clampless and sutureless aortic anastomotic technique. Eur J Vasc Endovasc Surg. 2014 Oct. 48 (4):400-6. [Medline]. Alimi YS, Hartung O, Orsoni P, Juhan C. Abdominal aortic laparoscopic surgery: retroperitoneal or transperitoneal approach?. Eur J Vasc Endovasc Surg. 2000 Jan. 19(1):21-6. [Medline]. Jean-Baptiste E, Batt M, Azzaoui R, Koussa M, Hassen-Khodja R, Haulon S. A comparison of the mid-term results following the use of bifurcated and aorto-uni-iliac devices in the treatment of abdominal aortic aneurysms. Eur J Vasc Endovasc Surg. 2009 Sep. 38(3):298-304. [Medline]. Martinez BD, George PM, Ameer A, Gerhardinger AM, Moses JT, Hansen JM. Laparoscopically assisted total daVinci aorto bifemoral graft bypass with a unique system of graft delivery. Ann Vasc Surg. 2009 Mar. 23(2):255.e1-5. [Medline]. Fourneau I, Mariën I, Remy P, D'hont C, Sabbe T, Daenens K. Conversion during laparoscopic aortobifemoral bypass: a failure?. Eur J Vasc Endovasc Surg. 2010 Feb. 39(2):239-45. [Medline]. Stádler P, Vitásek P, Matous P, Dvorácek L. [Hybrid robot-assisted surgery, aorto-bifemoral bypass with reconstruction of incisional hernia]. Rozhl Chir. 2008 Nov. 87(11):590-2. [Medline]. Kim JY, Kim YW, Kim CJ, Lim HI, Kim DI, Huh S. Successful surgical treatment of aortoenteric fistula. J Korean Med Sci. 2007 Oct. 22(5):846-50. [Medline]. Diks J, Nio D, Jongkind V, Cuesta MA, Rauwerda JA, Wisselink W. Robot-assisted laparoscopic surgery of the infrarenal aorta : the early learning curve. Surg Endosc. 2007 Oct. 21(10):1760-3. [Medline]. Rouers A, Meurisse N, Lavigne JP, Francart D, Quaniers J, Desiron Q. Potential benefits of laparoscopic aorto-bifemoral bypass surgery. Acta Chir Belg. 2005 Nov-Dec. 105(6):610-5. [Medline]. Helgetveit I, Krog AH. Totally laparoscopic aortobifemoral bypass surgery in the treatment of aortoiliac occlusive disease or abdominal aortic aneurysms - a systematic review and critical appraisal of literature. Vasc Health Risk Manag. 2017. 13:187-199. [Medline]. [Full Text]. Carrel T, Pasic M, Niederhäuser U, Turina M. [Extra-anatomic thoraco-bifemoral bypass: an excellent alternative to in-situ reconstruction for repeat revascularization of the lower limbs]. Schweiz Med Wochenschr. 1994 Jun 4. 124(22):961-5. [Medline]. Kim TH, Ko YG, Kim U, Kim JS, Choi D, Hong MK, et al. Outcomes of endovascular treatment of chronic total occlusion of the infrarenal aorta. J Vasc Surg. 2011 Jun. 53(6):1542-9. [Medline]. Schürmann K. [Reconstruction of the aortic bifurcation : Endovascular aortic repair (EVAR) and alternatives]. Radiologe. 2013 Jun. 53(6):519-25. [Medline]. Van Haren RM, Goldstein LJ, Velazquez OC, Karmacharya J, Bornak A. Endovascular treatment of TransAtlantic Inter-Society Consensus D aortoiliac occlusive disease using unibody bifurcated endografts. J Vasc Surg. 2017 Feb. 65 (2):398-405. [Medline]. O'Brien DP, Waldron RP, McCabe JP, Courtney DF. Descending thoracic aorto-bifemoral bypass graft: a safe alternative in the high risk patients. Ir Med J. 1991 Jun. 84(2):58-9. [Medline]. Suzer K, Omay O, Ozker E, Indelen C, Gumus B. Coronary artery bypass grafting and concomitant descending aorta-to-bifemoral artery bypass via sternotomy. Cardiovasc J Afr. 2009 Sep-Oct. 20(5):300-2. [Medline]. Kelley-Patteson C, Ammar AD, Kelley H. Should the Cell Saver Autotransfusion Device be used routinely in all infrarenal abdominal aortic bypass operations?. J Vasc Surg. 1993 Aug. 18(2):261-5. [Medline]. Obitsu Y, Shigematsu H. [Revascularization for the aortoiliac regions of peripheral arterial disease]. Nippon Geka Gakkai Zasshi. 2010 Mar. 111(2):79-83. [Medline]. Bajardi G, Ricevuto G, Grassi N, Latteri M. [Proximal anastomosis in aorto-bifemoral bypass. Technical considerations]. Minerva Chir. 1989 May 15. 44(9):1353-5. [Medline]. Meister RH, Schweiger H, Lang W. Knitted double-velour Dacron prostheses in aortobifemoral position--long-term performance of different coating materials. Vasa. 1998 Nov. 27(4):236-9. [Medline]. Stollwerck PL, Kozlowski B, Sandmann W, Grabitz K, Pfeiffer T. Long-term dilatation of polyester and expanded polytetrafluoroethylene tube grafts after open repair of infrarenal abdominal aortic aneurysms. J Vasc Surg. 2011 Jun. 53(6):1506-13. [Medline]. Dimick JB, Cowan JA Jr, Stanley JC, Henke PK, Pronovost PJ, Upchurch GR Jr. Surgeon specialty and provider volumes are related to outcome of intact abdominal aortic aneurysm repair in the United States. J Vasc Surg. 2003 Oct. 38(4):739-44. [Medline]. Morin JF, Rabbat AG. [Intestinal ischemia associated with aorto-bifemoral bypass]. Union Med Can. 1984 Jun. 113(6):508-10, 521. [Medline]. Becquemin JP, Melliere D, Benhaiem N. Late occlusion of aorto-bifemoral grafts. Causes and management. J Cardiovasc Surg (Torino). 1987 Jan-Feb. 28(1):12-7. [Medline]. Vogel TR, Dombrovskiy VY, Carson JL, Haser PB, Lowry SF, Graham AM. Infectious complications after elective vascular surgical procedures. J Vasc Surg. 2010 Jan. 51(1):122-9; discussion 129-30. [Medline]. 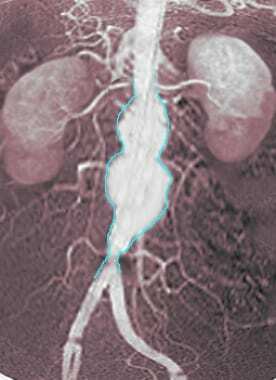 Image shows aorta iliac bypass. Image shows bypass of aneurysmal portion of aorta.